Los Angeles is officially a dumpster fire. There’s no question that the LA Lakers are the most coveted and popular franchise in the surrounding area. After that, you might make the argument that it’s the Dodgers or Kings who take the second place title, but you might be surprised that it’s actually the Oakland Raiders, which brought the city its only Super Bowl championship in early 1984. The point is it’s hard to become an affectionate team in Los Angeles if you don’t win. The Los Angeles Lakers have scraped the bottom of the barrel of the NBA for the last ten years. But Lakers President Magic Johnson just shocked everyone in Los Angeles when he made a surprising spur-of-the-moment announcement. To even put it mildly, the Los Angeles Lakers had such high hopes for landing the most coveted free agent of the last offseason with LeBron James, but this season turned out to be a dumpster fire. James was out 17 games with a groin injury and they could never quite capitalize when he was healthy. But a couple of weeks ago Lakers’ owner Jeanie Buss expressed her disdain that there was a diffusion of responsibility within the organization. The report she was referring to was some people in the organization that were players on the team had a hatred for head coach Luke Walton, which created a hostility because the executives did nothing about it. This includes Lakers’ President Magic Johnson. And in a weird twist of fate – given Johnson’s legendary basketball icon status and savvy businessman persona – the Hall of Famer officially stepped down on Tuesday while allegedly not informing Jeanie he was doing so in a impromptu press conference. He boasted that his personal company was “exploding” and he couldn’t give “a hundred percent” to both things. What’s awful about the timing of this announcement is that it undermined Dwyane Wade’s last game as an NBA player. It was sort of reminiscent of when the Golden State Warriors on the last game of the season four years ago went on to break the coveted all-time regular season record set by Michael Jordan’s Chicago Bulls of 72-10 to 73-9. Ironically, it was Kobe Bryant’s last game that upstaged that “unbreakable” record during an insignificant game when he scored an astounding 60-points before retirement. At least he acknowledged it. 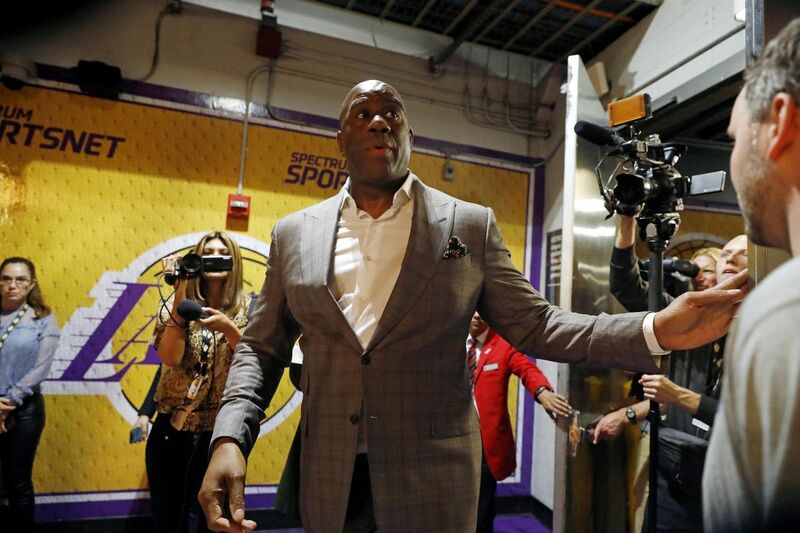 Jeanie Buss has to get busy right now because if she wants her Lakers to return to glory for the upcoming season, with an offseason loaded with highly coveted free agents, then she needs to replace Magic Johnson immediately.